Wind Energy has been used since several years to power homes, sail boats, pump water from wells or heating and cooling homes and offices. Today with the ever increase in the demand for fossil fuels and with the prices soaring all time high numerous resources have been invested in the wind energy. Wind energy has its own advantages and disadvantages. While on one side it is renewable source of energy and cause less air and water pollution, on the other hand it also dirupts the ecological balance as it poses threat to wildlife. Also, Wind energy can not be produced everywhere since you need strength of wind to produce energy from it. Today less than 5% of total world energy demands are met by wind energy and in the years to come this figure is going to be much higher. This article covers the topic of “How Wind Turbines Work” and basic understanding of the generation of electricity through out wind turbines. Here is an animated info-graphic explaining how wind turbines work. Basically there are two types of wind Turbines: vertical axis wind turbine and horizontal axis wind turbine. Both of them work in the exactly same way except the difference in their design. The process of producing electricity is the same in both the turbines. Wind Turbines consists of a rotor or blades which converts the wind’s energy into mechanical energy (turbine). 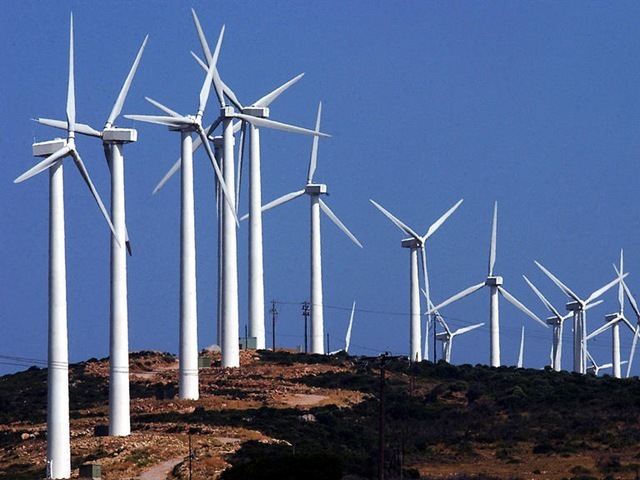 The energy that moves the wind (“kinetic energy”) moves the blades. They(blades) spin a shaft that leads from the hub of the rotor to a generator. The generator turns that rotational energy into electricity which is then stored in batteries or transferred to home power grids or utility companies for use in the usual way. If you place an object like a rotor blade in the path of that wind, the wind will push on it, transferring some of its own energy of motion to the blade. This is how a wind turbine captures energy from the wind. At its essence, generating electricity from the wind is all about transferring energy from one medium to another. Just go through the video below and see how wind Turbines convert wind into electricity. How wind Turbines work have to do with the size and shape of the rotors, the location of the turbine, height of the blades. Two or three bladed turbines are most popular now days because of more thrust and less wind resistance. wind Turbines can be made cheaper if more people opt for it. Mass production in case of wind energy will bring down the material and installation cost, which today is not possible for average consumer who needs cheap electricity.